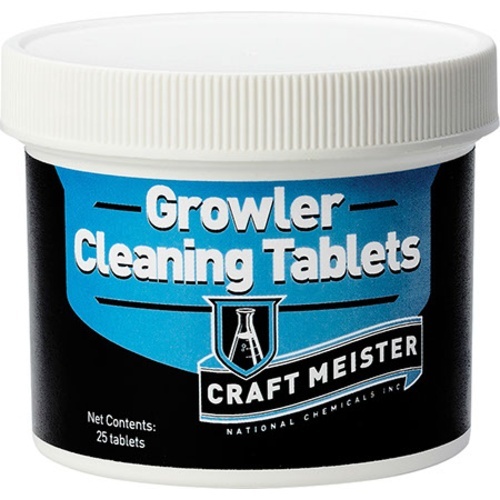 Craft Meister Growler Cleaning Tablets are the easiest and most effective way to keep all of your glass, stainless and plastic growlers clean and beer ready. Just fill the growler with warm water, add a Tablet, soak for 10-15 minutes, then dump and rinse. The Tablets rinse away easily with no fragrances, dyes or residues left behind. Also works great on drinking water bottles, Erlenmeyer flasks, and coffee mugs and pots. Fill Growler with warm water. Add 1 tablet and let dissolve. Soak for at least 10 minutes. Empty growler and rinse thoroughly. Repeat if necessary, sanitize if required. For heavy soils: Use 2 tablets. Let soak overnight up to 24 hours. Increase water temperature. The MoreBeer! Growler - 64 oz. This works well for growlers, makes them easy to clean. These tabs are good for growlers, but they work great for starter flasks. Whether you create the starter in the flask or just buildup in it, I haven't had to scrub out a flask yet.